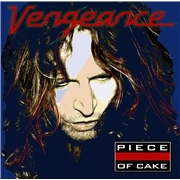 Sometimes golden oldies VENGEANCE is back with a release I didn´t know what to expect from. Over the years the line-up has changed, gone is sadly missed Jan Somers (R.I.P. ), and Arjen Lucassen is busy with AYREON. But still there is vocalist Leon Goewie and Timo Somers, Jan´s son, is still adding credibility in name. Past albums have either been almost divine 80´s easy going hard rock with strong refrains while their former outing (and a few more) was a mere AC/DC clone bringing little of interest to the world. The first seconds of this album was redeeming. No more cloning, only full-blast 80´s hard rock with a refrain to die for and the fun seemed back in the band. Next up is “Tears from the Moon” and I thought I´d put on “Arabia” by mistake. But VENGEANCE wasn´t quite gonna let me off the hook that easily. “Raintime Prelude” and “Raintime” didn´t exactly bring the house down. They still steered clear of the Australians, but the style was 90´s something and a bit lethargic. But “Back to Square One” in all its balladry was back to the day again, this time even reminiscing of the late great GARY MOORE. Fortunately for me both “Headquake” and “Train” are almost prime time eighties hard rock and retro-VENGEANCE of the kind I used to love. A slight setback is the title track which hits back at the Young Brothers, while “Mirrors” is a piece of Leon Special, but you must like the way he uses his vocal chords…or else. They go out in fine fashion with “Goodbye Mother Skye”. We´re talking heavy grooves here, with more uniqueness than AC…, and a great lead. VENGEANCE in 2013 opened the album with a 5/5 song, and ends the same way. It gives me great pleasure to recommend this album.